There are few more pleasurable London experiences than supping a pint in an olde-worlde pub. The British capital is sprinkled with characterful establishments that have been serving drinkers for centuries, and they continue to cast a spell over wide-eyed thirsty tourists. But whether it's down to their Insta-worthy decor, spine-tingling past or famous former patrons, certain joints stand out from the crowd. Entering this wonderful 17th century-built pub via a narrow alley off historic Fleet Street, you'll feel like you've fallen through a time portal thanks to the low beamed ceilings, narrow stairways and labyrinth of dimly-lit bars and rooms with sawdust-sprinkled floors. Ye Olde Cheshire Cheese has survived the reigns of 15 monarchs and is especially atmospheric in winter, when its open fires crackle, and creamy ales warm the soul. Drinking here, you'll be following in the footsteps of the likes of Charles Dickens, Sir Arthur Conan Doyle and Mark Twain. Dickens also liked to frequent this famous boozer, even referring to it in his novel, Little Dorrit. Built in 1677, tucked off Borough High Street and now owned by the National Trust, The George is the only remaining galleried inn in London. Once fashionable with travellers looking to rest their weary heads after long, horse-drawn coach journeys, the pub is now a magnet for day-time drinkers, especially on fine weekends when the cobbled courtyard is a sociable sun trap, lorded over by the building's balustraded flower-adorned balconies. If it's raining, the antique, multi-roomed interior is a cosy alternative. With its half-timbered Tudor-esque black and white facade and decorative stained-glass windows, this George is one of the most distinctive buildings on the Strand, a thoroughfare linking The City with the West End. Initially a coffeehouse, it opened as a pub in 1723 and on weekday lunchtimes, and after work, its ground-floor bar and first-floor restaurant (The Pig & Goose) is abuzz with customers, including lawyers who work across the road at the vast Royal Courts of Justice. Call in here for a beer or two and a home-cooked meal, such as roast cod, sea bream or steak and chips and ask the bar staff about the pub cellar. Apparently, it's haunted. It isn't always easy to find a memorable place to drink in chain bar-packed Covent Garden, but this Georgian-era pub is worth seeking out. Another old Dickens haunt, rich in original wood panels, it's hidden down little Rose Street, off bustling Garrick Street. It was formerly The Coopers Arms, though better known locally as 'The Bucket of Blood' thanks to the bare-knuckle prize fights staged here. Its upstairs room, the Dryden Room, was named after the poet John Dryden, who was apparently beaten up outside in 1679 by thugs hired by an earl with whom he had a long-standing quarrel. Things are much more civilised nowadays, and you'll often see crowds spilling out onto the pavement, mingling over drinks. 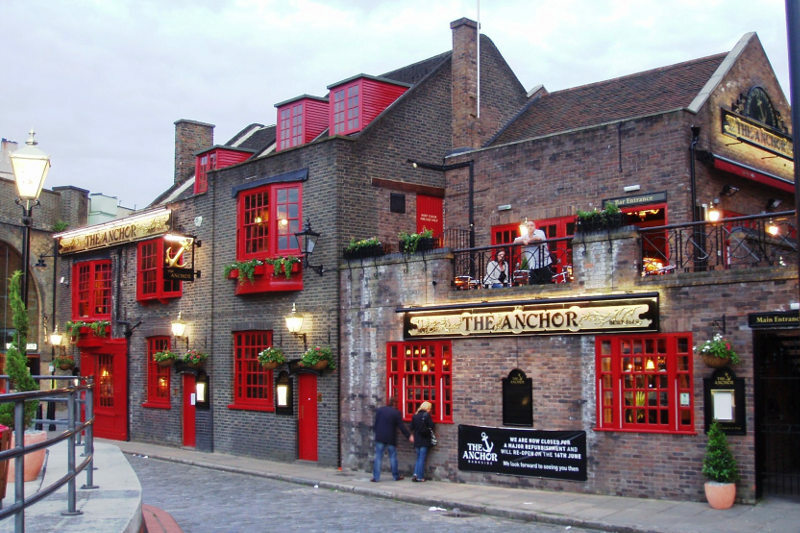 Perched on the south bank of the Thames, between Shakespeare's Globe and London Bridge, the Anchor claims to be the place from which Samuel Pepys witnessed the Great Fire of London in 1666. In his diary, Pepys described the dreadful heat and 'fire drops' falling on him while in a boat on the river, so he sought refuge in 'a little alehouse on bankside and there watched the fire grow'. The pub has been modernised since Pepys' day, but its maze of old rooms, and neck-crunchingly low ceilings, have a bygone charm. Another former punter was Dr Samuel Johnson, who is believed to have penned some of his famous 1755 dictionary here (this, of course, is the man who said: "When a man is tired of London, he is tired of life....").